The Telegraph‘s Ambrose Evans-Pritchard describes the weekend deal at the EU summit as a “total German triumph”. He paraphrases Chancellor Angela Merkel saying that “whoever wants credit must fulfil our conditions”. Much was discussed and a little agreed during Friday?s eurozone summit, but it was enough to give the euro a bit of a boost. Investors – going into the weekend with exceptionally low expectations – seemed pleased with the news that anything was agreed at all. The US defence budget seems set to fall as Washington begins to restore order in its finances. Spending on the military has reached such heights ? $700 billion, or 20 per cent of the US federal budget ? that it has become too large for deficit-cutters to ignore. Even traditionally pro-defence Republicans now argue that military expenditures need to be reduced along with other government expenses. Europe, too, will feel the pinch: many of the American soldiers currently based on the continent seem certain to go, and some joint weapons programmes will be cancelled. In case of future crises in Europe, NATO?s and the EU?s ability to respond will be tested. The US will expect Europe to lead but European allies themselves have been reducing forces and budgets. The head of France’s far right National Front party, Marine Le Pen, criticised yesterday (14 March) what she described as slack controls that had allowed tens of thousands of clandestine immigrants into Europe through Sicily. As we’ve noted before, the EU is in desperate need of a single patent – virtually overnight, such a patent would boost competitiveness and growth and attract innovation, not least by cutting costs for SMEs. It’s currently around 15 times more expensive to obtain a patent across the EU than obtaining patent protection in the US. Or to illustrate using other estimates: a patent validated in 13 EU countries costs as much as ?20,000, of which nearly ?14,000 arises from translation alone (according to the European Commission). The regional and local authorities challenge the central governments of the member states of the European Union by demanding equal partnerships and ?territorial pacts? when the National Reform Programmes (NPR) are devised and implemented, in order to achieve the headline targets of the Europe 2020 strategy for growth and jobs. The real Europe 2020 summit? In a few days, the political leaders of the EU member states meet to assess progress towards the strategic economic goals of the European Union and to inspire improved performance on the reform trail. The ideal of multiculturalism: Rest in Peace? Multiculturalism is dead. At least, according to many prominent EU-leaders. It?s a shame though, that they didn?t present a feasible alternative to the multicultural society. Should we say our permanent farewells to the multicultural ideal, or should we instead try to reform it, giving it a chance to survive? I?ll try to answer that question below. 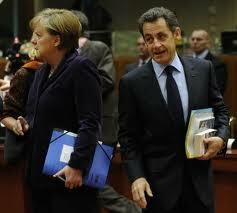 EU summit: Sarko stands alone? Today?s back-to-back European Union summits in Brussels kick off with a discussion on Libya, and it?s sure to be dominated by Nicolas Sarkozy?s unexpected decision to recognise the opposition Libyan National Council as the legitimate representatives of the Libyan people. Moody?s decision to downgrade Spain?s sovereign credit rating from Aa1 to Aa2 was very unwelcome to the Spanish government yesterday, but it may have come as a timely reminder to other European leaders, meeting in Brussels today, that they are still a very long way from solving the sovereign debt crisis. Ever since the beginning of the year, the markets have been willing to give the benefit of the doubt to the European negotiators, believing that the Germans and the French had finally come to the view that some form of fiscal burden sharing was a better alternative, for themselves as well as for the troubled economies, than the risk of sovereign defaults, or worse still the break up of the euro. The European Citizens? Initiative (ECI) is a new instrument whereby the European Commission has to put forward legislative proposals to respond to a petition that has gathered one million signatures within a year coming from at least 7 EU Member States. Although some organisations such as eBay or Greenpeace have already started ECI-like petitions, the first ?official? ECIs are expected as of February 2012 in order to allow Member States to take the necessary measures to implement the new scheme. Some remarks on the Council briefing: Off the record! This morning, thanks to my short-term blogger accreditation, I?ve been at the off-the-record briefings on the upcoming Competitiveness Council (see my previous posts on my preparations for the Council here and here). Forcing the small minority of Muslim Frenchwomen who wear the niqab is like trying to use a very large sledgehammer to crack a very small nut. You can discuss with @ronpatz on Twitter under #Eupilot and follow him blogging live from the EU Competitiveness Council on the Bloggingportal.eu blog. How did the ministers for employment and social affairs in the EPSCO Council prepare the upcoming spring meeting of the European Council 24 to 25 March? An increasing number of countries in Europe are beginning to suffer from what can best be described as ‘green fatigue’. In fact, the mood has changed radically since March 2007 when EU leaders agreed to their ambitious green targets. It will be Luxembourg that will have the final say on Brussels versus Strasbourg, now that Paris has decided to sue under Lisbon. In other words, the fight over the seat of the European Parliament has suddenly become a full-blown EU inter-institutional brawl. Last year, after the Greek bail out, Germany was accused of a haughty, arrogant demeanour. It hectored profligate southern European Union Member States for their spendthrift and unrestrained ways. As the European Union?s leading industrial power, and a relatively careful spender, the Germans responded: if the European Union and Monetary Union are to survive, the spenders need to buckle-up and take the medicine, even if tastes foul. And Berlin had an important point: why should German workers work harder and longer so that their southern neighbours could live a life of luxury and retire early? Prompted by the nuclear catastrophe in Japan, Germany will shut down its seven oldest atomic energy plants for three months. With this move the hitherto pro-nuclear government has ushered in a radical change to its energy policy, the press commends, and hopes the rest of Europe will soon follow suit. Italy?s official celebration of its founding moment finds the country in a dark mood and a long way from home. Geoff Andrews marks the moment and looks for signs of hope. On 17 March 2011, Italy celebrates its150th birthday. The movement for independence known as the Risorgimento – forged out of years of wars, revolutions and rebellions – led finally to the proclamation of an Italian nation in 1861, with its first parliament in Turin. The controversial ‘Prevent’ strategy, that aims to stop terrorism before it occurs by working with Muslim communities, is now under review. The government have signaled that ‘Prevent’ will no longer work with ‘non-violent extremists’, but who will they place under that category, and how will we know where the line is drawn? On 17 February 2011 the European Parliament adopted a resolution ‘Europe 2020’ (P7_TA(2011)0068), which had been tabled by the EPP, S&D, ALDE, Greens/ALE and ECR groups. Negotiations on the shape and form of the eurozone’s permanent bailout scheme – the “European Stability Mechanism (ESM)” – are entering a crucial phase. The fund is meant to be up and running by mid-2013 and is likely to have ?500bn available. Of this amount, between ?80bn and ?100bn will be up-front cash from member states – the rest will come in the form of guarantees.